February 8 is the feast of St. Josephine Bakhita, the patron saint of victims of modern slavery and human trafficking; a good day to join with others to pray for those affected by the crimes of modern slavery and the people that volunteer and work to eradicate this crime. Saint Josephine Margaret Bakhita was born around 1869 in the village of Olgossa in the Darfur region of Sudan. She was a member of the Daju people and her uncle was a tribal chief. Due to her family lineage, she grew up happy and relatively prosperous, saying that as a child, she did not know suffering. Historians believe that sometime in February 1877, Josephine was kidnapped by Arab slave traders. Although she was just a child, she was forced to walk barefoot over 600 miles to a slave market in El Obeid. She was bought and sold at least twice during the grueling journey. For the next 12 years she would be bought, sold and given away over a dozen times. She spent so much time in captivity that she forgot her original name. As a slave, her experiences varied from fair treatment to cruel. Her first owner, a wealthy Arab, gave her to his daughters as a maid. The assignment was easy until she offended her owner’s son, possibly for the crime of breaking a vase. As punishment, she was beaten so severely she was incapacitated for a month. After that, she was sold. One of her owners was a Turkish general who gave her to his wife and mother-in-law who both beat her daily. Josephine wrote that as soon as one wound would heal, they would inflict another. She told about how the general’s wife ordered her to be scarred. As her mistress watched, ready with a whip, another woman drew patterns on her skin with flour, then cut into her flesh with a blade. She rubbed the wounds with salt to make the scars permanent. She would suffer a total of 114 scars from this abuse. In 1883, the Turkish general sold her to the Italian Vice Consul, Callisto Legani. He was a much kinder master and he did not beat her. When it was time for him to return to Italy, she begged to be taken with him, and he agreed. After a long and dangerous journey across Sudan, the Red Sea, and the Mediterranean, they arrived in Italy. She was given away to another family as a gift and she served them as a nanny. Her new family also had dealings in Sudan and when her mistress decided to travel to Sudan without Josephine, she placed her in the custody of the Canossian Sisters in Venice. While she was in the custody of the sisters, she came to learn about God. According to Josephine, she had always known about God, who created all things, but she did not know who He was. The sisters answered her questions. She was deeply moved by her time with the sisters and discerned a call to follow Christ. When her mistress returned from Sudan, Josephine refused to leave. Her mistress spent three days trying to persuade her to leave the sisters, but Josephine remained steadfast. This caused the superior of the institute for baptismal candidates among the sisters to complain to Italian authorities on Josephine’s behalf. The case went to court, and the court found that slavery had been outlawed in Sudan before Josephine was born, so she could not be lawfully made slave. She was declared free. For the first time in her life, Josephine was free and could choose what to do with her life. She chose to remain with the Canossian Sisters. She was baptized on January 9, 1890 and took the name Josephine Margaret and Fortunata. (Fortunata is the Latin translation for her Arabic name, Bakhita). She also received the sacraments of her first holy communion and confirmation on the same day. These three sacraments are the sacraments of initiation into the Church and were always given together in the early Church. The Archbishop who gave her the sacraments was none other than Giusseppe Sarto, the Cardinal Patriarch of Venice, who would later become Pope Pius X.
Josephine became a novice with the Canossian Daughters of Charity religious order on December 7, 1893, and took her final vows on December 8, 1896. She was eventually assigned to a convent in Schio, Vicenza. For the next 42 years of her life, she worked as a cook and a doorkeeper at the convent. She also traveled and visited other convents telling her story to other sisters and preparing them for work in Africa. She was known for her gentle voice and smile. She was gentle and charismatic, and was often referred to lovingly as the “little brown sister” or honorably as the “black mother.” When speaking of her enslavement, she often professed she would thank her kidnappers. For had she not been kidnapped, she might never have come to know Jesus Christ and entered His Church. On the evening of February 8, 1947, Josephine spoke her last words, “Our Lady, Our Lady!” She then died. Her body lay on display for three days afterwards. In 1958, the process of canonization began for Josephine under Pope John XXIII. On December 1st, 1978, Pope John Paul II declared her venerable. Sadly, the news of her beatification in 1992 was censored in Sudan. But just nine months later, Pope John Paul II visited Sudan and honored her publicly. He canonized her on October 1, 2000. 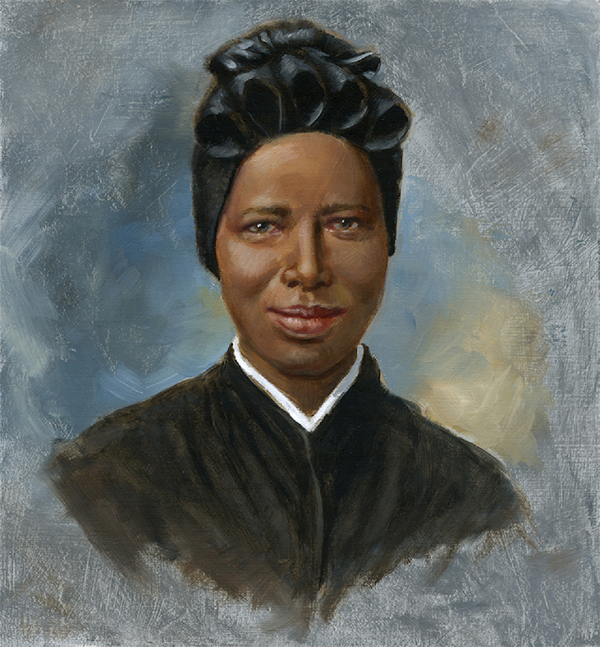 Saint Josephine Bakhita is the patron saint of Sudan and her feast day is celebrated on February 8.